When I took my first glance at the Keyprop on Kickstarter, I’ve got to admit that I initially laughed it off as another silly Kickstarter smartphone-related campaign that I’d probably never think about again. But for some reason, I found myself watching the promo video for it, then looking at the pictures in the posting, saw the use cases, and then couldn’t help but hope it was reasonably priced. Thankfully, it was because this is actually something I could see being pretty useful in a pinch or even on a regular basis. Keyprop is a smartphone stand that comes in a variety of colors and fits easily onto your keychange, disguising itself as nothing but another key. It runs $15, and should work on almost any smartphone including the Galaxy S3 and Nexus 4 (iPhones too). The tip of the key has a couple of notches that can either fit inside the charging port of your device or the headphone jack, which helps it stabilize your device in an upright position. 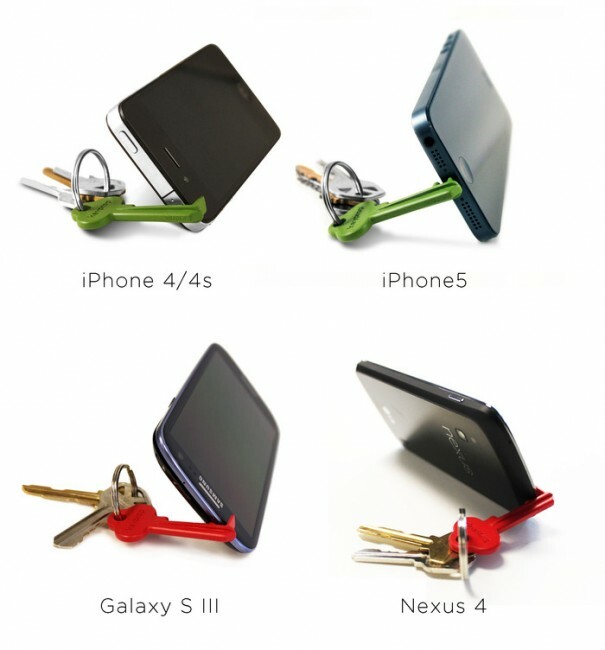 You can even adjust your keyring to provide other angles for better viewing. Seriously, it’s kind of brilliant. It has 8 days to go still and is about 60% funded, so there is no guarantee that this will happen. But for those looking for an always-with-them smartphone stand, give it a view.